Vincent van Gogh’s only etching is on view as a part of a show on Art Nouveau era graphics from the Netherlands. 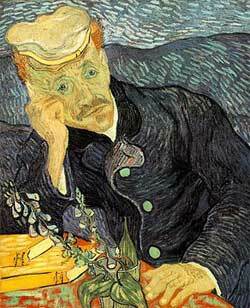 After a stay at the mental sanitarium in Saint-Rémy in Provence which began not long after his famous ear cutting incident, van Gogh traveled north, to Auvers-sur-Oise, on the northern outskirts of Paris, to be taken under the care of Dr. Paul Gachet, reportedly a homeopathic physician with something of a reputation for dealing with melancholia. The painter Camille Pissarro, a friend of van Gogh’s, had suggested the connection based on Gachet’s treatment of various artists in the Paris area. As well, in the Paris environs, Vincent would be much closer to his dear brother, Theo, which, under the circumstances, seemed like a good idea. Dr. Gachet had treated Renoir for pneumonia in 1882, and knew Manet, Cézanne, Courbet and Pissarro, among others. Several van Gogh’s oil portraits of Dr. Gachet emerged from that period, as did van Gogh’s noted painting of the church in Auvers. Alas, van Gogh died in 1890, not long after his move to this area. It was long thought that van Gogh’s bullet wound in the stomach which led to his premature death at 37 was a result of a suicide attempt. A recent biography, Van Gogh: The Life (2011) by Pulitzer Prize-winning writers Steven Naifeh and Gregory White Smith, strongly suggests an alternative account, that van Gogh was shot by a group of errant young men from the neighborhood. Amazingly, over the course of his relatively short period of productivity, Vincent van Gogh produced several thousand works including many oils and drawings. He had a far shorter list of prints, totaling only about ten, most of which were lithographs. 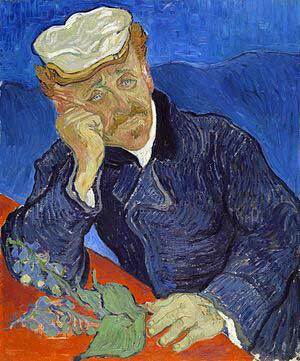 The only etching van Gogh ever did was a small one, of Dr. Gachet. The pose is quite similar to the pose struck in the oil portraits, but it has a lighter, less dense, quality about it that is fascinating and illuminating. 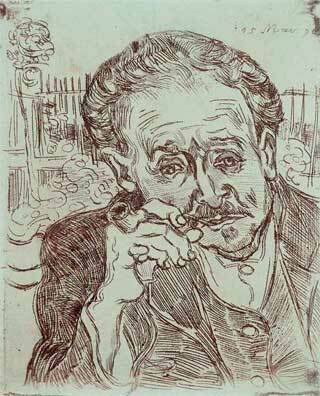 Dr. Gachet was an amateur etcher and it was under his supervision that van Gogh produced this piece. The result is modestly sized but subtly executed and the whole story of its subject, its creation and the relationship between van Gogh and Gachet, is a touching one. This work shows up in a rather understated way in a show that is currently on at the Museum of Fine Arts, Boston, Holland on Paper: The Age of Art Nouveau. The show, as a whole, takes up a relatively short hallway at the museum, but is full of wonderful works, mostly prints and posters. The van Gogh piece is a small addendum to a row of boldly colored posters, but it is, in its own right, an exquisite work. The delicacy in some of the rendering is notable. The care and artfulness of the gentle lines with which the artist creates the suggestion of form in Gachet’s hair or, with more densely packed lines, the modeling in his coat, is striking. The delicacy of the lines also gives an alternative interpretation of Gachet’s face to the ones in oil with which one is likely to be more familiar. Despite the comment of Theo van Gogh, who said of this work -“… a true painter’s etching. No refinement in the execution, but a drawing on metal…” – there is, I would argue, along with the undulating forms that represent the connection to van Gogh’s exuberant painting technique, also a refinement of line in parts of the etching that are quite dissimilar to the painterly robustness. This little work, exhibited in a corner of a show with a lot of colorful and bold graphics, is a gem in its own right. As van Gogh’s only etching, as a late work, and as a beautiful elaboration on the Gachet theme, it deserves a detour and some careful attention. Apparently, Dr. Gachet’s son made about 60 prints from van Gogh’s plate after the artist’s death, so there are multiple copies of the work. A number of them are owned by the van Gogh Museum in Amsterdam and some are in private collections. The Museum of Fine Arts, Boston, has one of them. 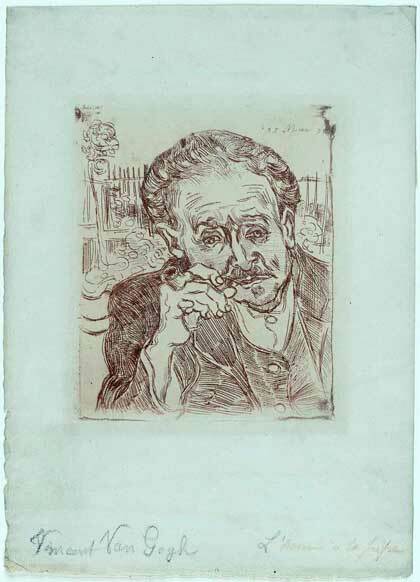 After van Gogh’s death, Paul Gachet Jr., Dr. Gachet’s son, made about 60 prints of the portrait from van Gogh’s plate. The Museum of Fine Arts, Boston has one of them.